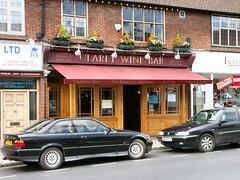 Pub in Cheam, sister to the Claret Free House in Addiscombe. Inside, it's long and narrow, but additional natural light is provided by a skylight near the back. Old pump clip badges decorate the exposed ceiling beams, and there's a photocollage of regulars on one wall. A wrought iron staircase leads upwards near the entrance. The feel is generally pretty traditional; the floor is carpeted except for a strip of mosaic tiles directly around the bar. Kake and James visited on a Tuesday afternoon in October 2010. Four real ales were on: Cottage Brewery Hurricane, Shepherd Neame Masterbrew, Palmers 200, and Weltons Pinta That. A half each of the Hurricane and Scrumpy Jack cider came to £2.95. Music was playing on the radio (Magic 105.4). Food served lunchtimes and evenings, according to the 2010 Good Beer Guide. Quiz night on Mondays (except Bank Holidays) from 9pm, according to a sign seen in October 2010. Accessibility: Very small step to get in. Once you're in, it's on the level except for the seating at the very back, which is on a dais. The corridor to the toilets is a little narrow. Last edited 2013-09-12 22:31:17 (version 7; diff). List all versions. Page last edited 2013-09-12 22:31:17 (version 7).